Problems? We have solutions. Dealers get results. We’ve heard some real horror stories about how miserable your DMS can make you. Some of you have been putting up with this for a long time. 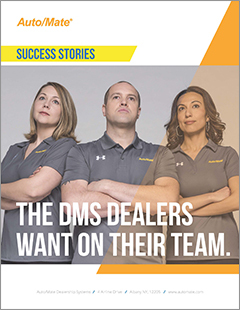 So to help you envision a future where you actually enjoy working with your DMS, we’ve prepared a packet of success stories highlighting how our Customers have benefited by switching to Auto/Mate. Check out our customer success stories or watch these testimonials from dealers that are switching to Auto/Mate.